Congrats to Tsamporado for the winning entry and 50 duck prize. Thanks to everyone who entered and voted! Here are the final results of the Caption this drawing caption contest. "Reverse psychology. Sometimes it works." 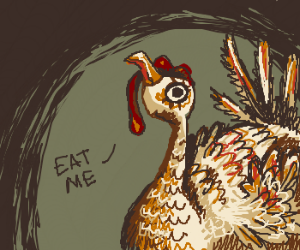 In Soviet Russia , Turkey eats you! Live Bait... it works every time. Suicidal Tendencies : Live in Turkey. Turkey unimpressed by the infinite void. Turkeys are capable of speech? Tragic result of Lemming/Turkey love. This turkeys had enough. Goodbye. Don't hesitate - I LOVE being gobbled. Tom's poor choice in Distasteful slang..
And so Billy fulfilled his destiny! You gonna eat me? Well Eat me! Sorry my feathered friend, I'm Vegan! Turkey sacrifices self to save others. uhh, are you coming on to me? That turkey is tired of living. All I can hear is "GLUGLUGLU"! Turkey says TG is over, so screw off. Come on, I'm done with the Turkey jokes! Selfless turkey is prepared to die. PTSD has driven Mr. Turkey to the brink. Hurry up! Wanna be filled with a carrot! "EAT ME." the elegant bird demands. Tommy Tukey is luring Hungry Humans. Depressed turkey trying to suicide. A lovely chicken that wants to be eaten.